Today, MJ is launching The Book of Lost Fragrances and on a blog tour introducing us to her book as well as some of the fragrances that inspired the story. 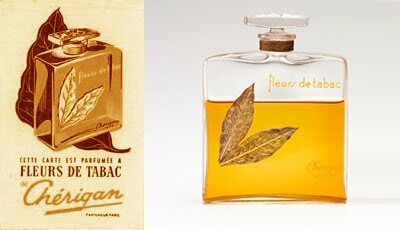 Fleurs de Tabac has a brisk citrus opening over a dry, smokey vetiver heart which is imbued with tiny star-shaped jasmine blooms and sheets of pungent cured tobacco leaf. Finally, a rich amber/vanilla base and sensual muskiness reveals itself and trails off well into the drydown. A wonderful example of the European predilection towards tobacco-inspired scents in the 20's and 30's, and one that is sadly now lost to time. Pre-order The Book of Lost Fragrances by M.J. Rose and we’ll send you a free sample of Âmes Soeurs, the Scent of Soulmates. This exclusive fragrance, inspired by the novel, was created by Joya Studios and is not yet for sale. Joya’s Âmes Sœurs hints of Frankincense, Myrrh, Orange Blossom and Jasmine. It’s smoky uncommon finish suggests the past and the future, and lost souls reunited. Jac L'Etoile has always been haunted by the past, her memories infused with the exotic scents that she grew up surrounded by as the heir to a storied French perfume company. In order to flee the pain of those remembrances--and of her mother's suicide--she moved to America. Now, fourteen years later she and her brother have inherited the company along with it's financial problems. But when Robbie hints at an earth-shattering discovery in the family archives and then suddenly goes missing--leaving a dead body in his wake--Jac is plunged into a world she thought she'd left behind. M.J. Rose is a skilled writer and a remarkable storyteller. Using Cleopatra’s lost book of fragrance formulas as a stepping stone, Rose spins a tale replete with stunning twists and compelling characters that will keep readers turning the pages late into the night. M.J. Rose is the international bestselling author of eleven novels: Lip Service, In Fidelity, Flesh Tones, Sheet Music, Lying In Bed, The Halo Effect, The Delilah Complex, The Venus Fix, The Reincarnationist, The Memorist, and The Hypnotist. 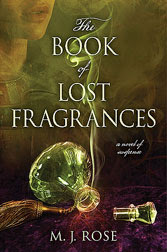 The Book of Lost Fragrances will be published in March 2012. Rose is also the co-author with Angela Adair Hoy of How To Publish And Promote Online, and with Doug Clegg on Buzz Your Book. Rose is a founding member and board member of International Thriller Writers and the founder of the first marketing company for authors: AuthorBuzz.com. As well as the co-founder of Peroozal.com and the popular website BookTrib.com. Rose has been profiled in Time magazine, Forbes, The New York Times, Business 2.0, Working Woman, Newsweek and New York Magazine. Rose has appeared on "The Today Show," Fox News, "The Jim Lehrer News Hour" and features on her have appeared in dozens of magazines and newspapers in the U.S. and abroad, including USA Today, Stern, L'Official, Poets and Writers and Publishers Weekly. M.J. Rose lives in Connecticut with Doug Scofield, a composer, and their very spoiled dog, Winka. To learn more about M.J. Rose and her work, visit her website at: www.mjrose.com. M.J. Rose is a Renaissance woman. She is a respected journalist and the internationally bestselling author of twelve highly acclaimed novels. She is the founder of AuthorBuzz, the first marketing firm for authors and one of the founding board members of International Thriller Writers. Rose has also co-founded Peroozal.com and the popular website BookTrib.com. She has an enduring passion for art, mythology and esoterica, as evidenced her Museum of Mysteries blog. In essence, M.J. Rose is a force to be reckoned with. Rose is also an impeccable researcher, often blending actual history into her spellbinding storylines. And her latest, THE BOOK OF LOST FRAGRANCES (Atria Books; $24.00; March 13, 2012), an engrossing thriller that weaves together reincarnation, ancient Egypt, international intrigue, and a lost book of fragrances, is no exception. It’s already been chosen as an Indie Next Pick for March and was recently named one of Publishers Weekly’s Top Ten Mysteries and Thrillers. Rose will also be part of Atria Great Mystery Bus Tour—In April, Atria Books will send four authors from three different countries to twelve cities. In preparation for writing THE LOST BOOK OF FRAGRANCES, Rose spent more than two and half years researching ancient treatises on perfumery and alchemy, traveling to flower farms and conventions, as well as studying with fragrance architects, famous “noses,” and niche perfumers. Based on that research, Rose provides exclusive author notes in THE BOOK OF LOST FRAGRANCES, as well a comprehensive glossary that offers factual information about some of the topics, locations, theories and legends she vividly weaves into her plot. While writing, to remain in the world of the novel, she burned incense and her favorite candles created by Frederick Bouchardy under the brand name JOYA. When the novel was finished she searched out Bouchardy to give him a copy of the yet to be published novel. Bouchardy was instantly intrigued by THE BOOK OF LOST FRAGRANCES—first, as a reader, he said he was taken with the mystery and romance of the story. In Rose’s tale, scent plays a strong role as it pertains to memory. Bouchardy, who creates using oils and other classic ingredients, said this notion spoke to him as a designer and producer of fragrances. The ancient fictional fragrance at the heart of Rose’s novel is called Âmes Soeurs, which means “Soul Mates” in French. Inspired by the book, Bouchardy has brought the perfume to life with his version: Âmes Soeurs, The Scent of Soul Mates. Bouchardy interpreted Rose’s imagined fragrance with notes of Frankincense, Myrrh, Orange Blossom, and Jasmine. Thanks for sharing this great post.Really looking forward to read more.